I had a two day transition from the Haute Route Pyrenees to the GR5 in the French Alps. Before I left Banyuls-sur-Mer, I went to the post office and was reunited with my pot! Those of you following know I accidentally left it a shelter a couple weeks ago. Why Not and Jim got there five days later and the pot was still there! They sent it, along with my mini Gossamer Gear chapstick I’d dropped another spot on the trail that they found, ha! They aren’t 100% in all that I’ve dropped, but pretty darn close. Why Not found and lost my pee rag early on (she claims not on purpose), and they missed the other chapstick I dropped, ha). My theory of keeping my friends behind me to sweep up after me is definitely working on the HRP. The first day of this transition was spent on the train for a full day. Well, technically, it was three trains, and unexpected bus for a technical train delay issue, and then a later than expected Uber ride to my host near Geneva. 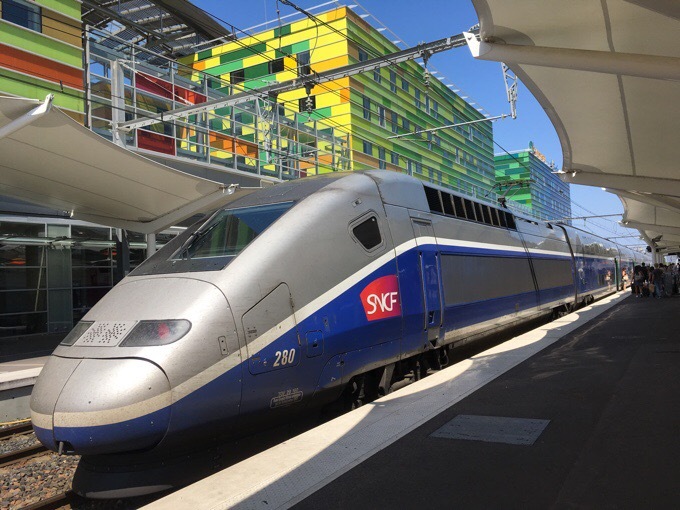 For much of the ride, I got to go on the speedy TGV that everyone hears about. I Skyped with my nephews while on the train and they may have been more in awe of this than anything I’ve done. It was nice, quiet, and such a smooth ride! I got to watch more of Breaking Bad and started the new Netflix series Ozark that’s pretty good. 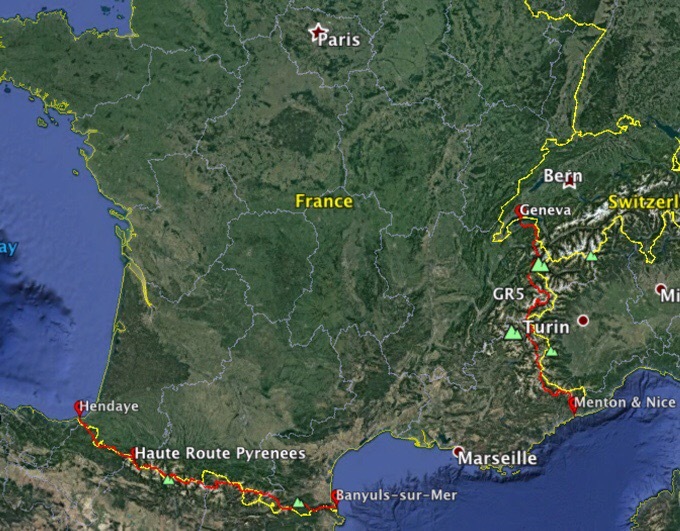 Here’s an overview photo to fully see where I went from Banyuls-sur-Mer to Geneva. 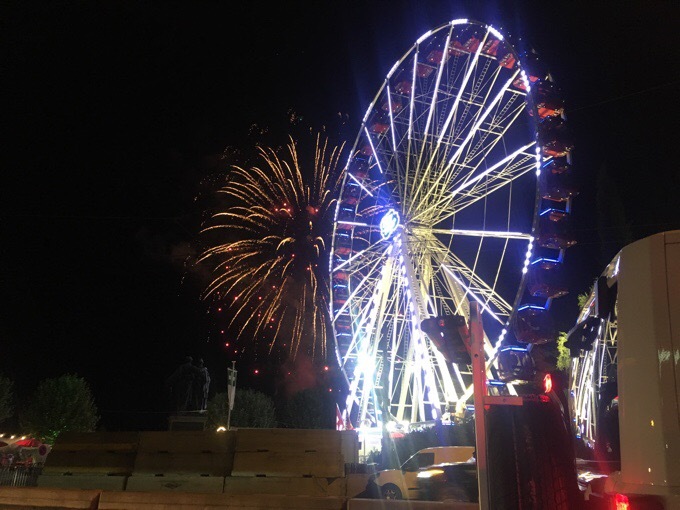 I arrived as there was a festival and fireworks over Lake Geneva. It was quite the welcome. I will fly out of Geneva at the end of September and plan to spend some daylight hours in the city then. Those that remember Angelynn (who I met on the Te Araroa, and hosted me wonderfully in Paris), her friend Marlyne lives on the outskirts of Geneva, Switzerland and kindly hosted me for two nights. She lives here with her husband and two boys. It was really so kind of her to host me, and I hopefully contributed some assistance while her husband is out of town. 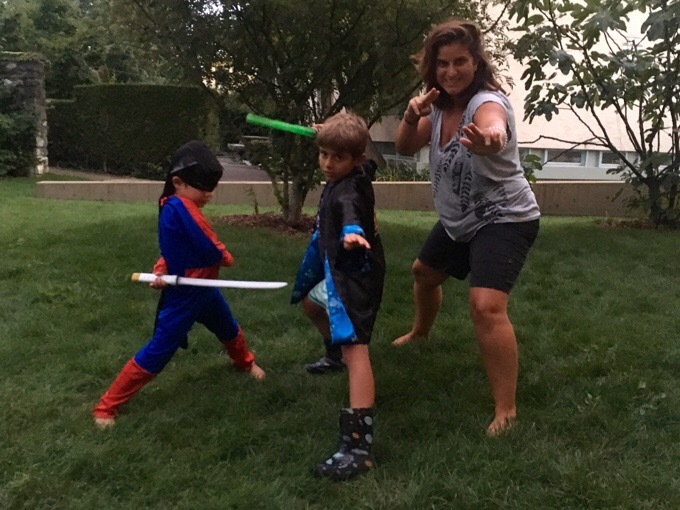 Here’s a photo I could only get the boys to take after telling them they could dress up as ninjas. Cracks me up. THANK YOU MARLYNE!!! My second day of transition was especially well timed because it stormed for much of the day. I love it when it really pours on my zero days and I am warm and dry on a couch with a ton of food. Just like the Pyrenees, weather can be strong in the French Alps, but looks like this first week should work in my favor with some pretty nice weather. 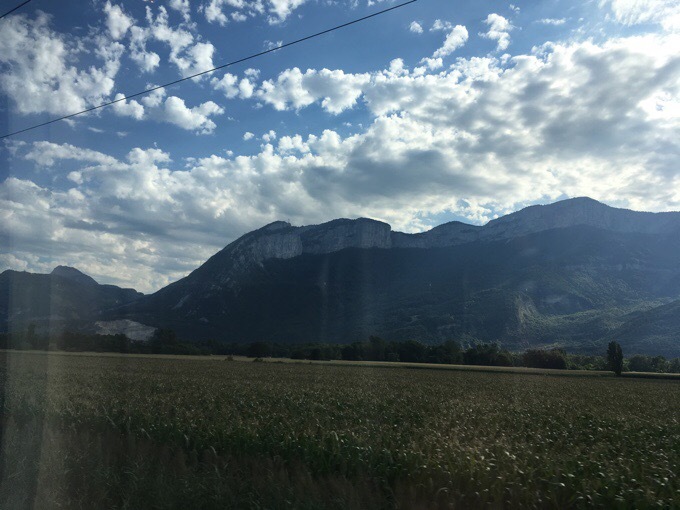 I got to see a preview of the hike as my train paralleled the French Alps. I think I’m really going to like this one. It reminds me of the mountains along the Great Divide Trail in Canada and I’m loving the clouds! Here’s a photo from the train. There is a high route similar to how the HRP was that avoids dropping down to villages so much and tries to stay high. Unfortunately, the guide for it is fairly new and only in French. I have the gpx track and advice on where to possibly stay high. I’ll see how it goes, but I think that no matter what, I’ll be happy with what I do. There are two main popular alts I’ll do in the middle and end, but other than that, I’ve yet to decide. As you can see, this route is in Switzerland for a brief bit before staying in France the rest of the way to the Mediterranean. The GR5 does run further north the full length of the France border, but this section south of Geneva is what everyone does and commonly is referring to when speaking of the GR5. It all kicks off tomorrow and should take about a month. I plan to do the more direct and steeper St Gingolph start (a two hour train ride from Geneva) that’s recommended for people that don’t find it necessary to ease into the elevation. I think my legs are adjusted to elevation quite well after the HRP. My phone plan doesn’t work in Switzerland, so there may be a gap before I get posts up. Here we go! Looking forward to your upcoming experience – sounds really fun and beautiful. 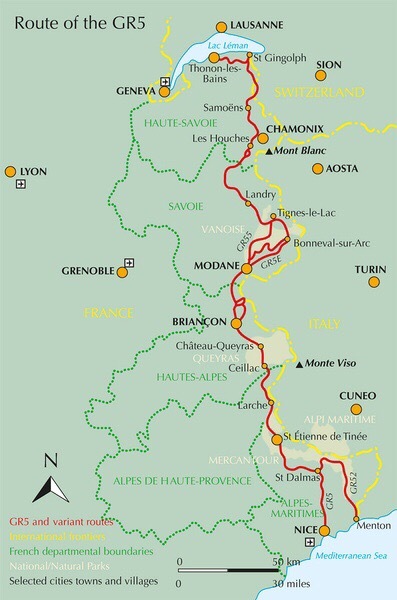 This is going to be fun .. in Chamonix do go up via the telepherique to the Aiguille du Midi, it is well worth doing.. in fact you can go quite over the Alps into Italy and back on the telepherique if you want to (and can afford it!) – it is a remarkable day, and the closest you can get to 4,000m high in Europe without strenuous effort! Love the photo of Marlyne & the other two badass ninjas!! Geneva is OK, the lake and the totally amazing fountain are the stars of the show.. Yes, the telepherique from the GR5 is the plan and then trams as well to other sites. Yay. Glad you were reunited with the pot and chapstick. Your life is once again complete. 🙂 Excited to hear/see your adventures on GR5 in the days/weeks ahead. Have fun! I always hated looseing my pot when I’m younger, and to actually have someone return it, That’s one Awesome trail family you got there. You sure are representing Gossamergear well. From chapstick to packs, They seem to be working out well. I have a whole year to rethink my strategy and there sure to be a part of it. Looking forward to this next hike of yours, I’m sure others will appreciate your insights as the guidebook is only in French. Have an Awesome Hike Erin!! The GR5 guide is on English. It’s the alternate routes that are in French that I may not do. In 2013 I did the GR5 from north of Strassborg to Briancon. The northern part is pastural, less crowded, and more historical. The Alpine part is much easier than the Pyranees, with little talus and less steeps, except next to Mt Blanc. It should be even more fun since you are in super shape. In town stay in a gite d’etap for $20. “Cameos”??? “Hiker reunions”??? I’m intrigued – can’t wait to find out WHO. God speed, Wired! I hope they all work out. It seems everyone is out here doing something this year. Looking forward to the reunions! 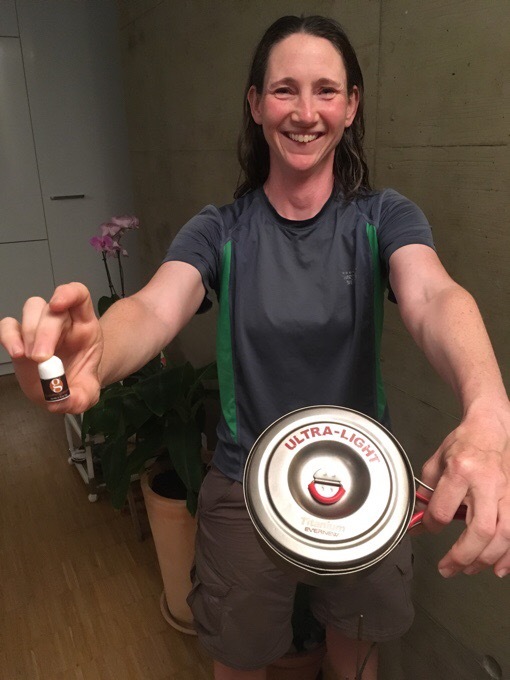 Now that your pot is back with you does the temporary one to into a hiker box as trail magic (or for dog food)? Haha, threw it out asap! Reunited with your pot! and with some friends. That is gonna be awesome. Can’t wait for the reveal.